Everton defender Leighton Baines will play in a behind-closed-doors friendly during next week's international break to aid his recovery from injury. The England international, 30, has yet to play competitively this season after twice having surgery on his ankle. 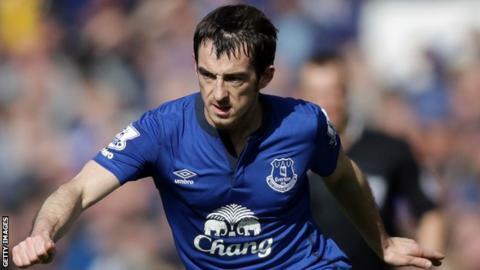 Baines is back in training but manager Roberto Martinez said he would not be fit to face West Ham on Saturday. Team-mate Bryan Oviedo is also unavailable after injuring his hamstring against Sunderland. "We have a got a game that will be behind closed doors in the international break and Leighton will be playing a part in that," said Martinez. "He needs to have that confidence when making blocks and the contact you can get in a football game. "You only get that by those sorts of exercises because training isn't good enough in order to test yourself, so we will do that behind closed doors. "That's why I feel the international break is going to be a really important period to get that."